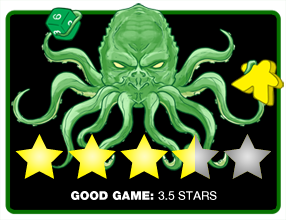 We review Hellapagos, a survival and negotiation game published by Gigamic. In Hellapagos, players are shipwrecked on a desert island and must work together to survive and ultimate escape the island. Over the last decade or so, television has brought survival situations into the mainstream. Through Survivor, Man vs. Wild, Survivorman, and others, you can watch people try to make it through the day without the creature comforts that most of us are used to having in our lives. However, if you are ever in an actual survival situation, it isn’t going to be that glamorous. I tried it for 48 hours years ago and it was a struggle just to keep myself hydrated and fed. In Hellapagos, the game is more like my situation then something on TV. You and your fellow players are trying to get off a deserted island before a massive hurricane hits! However, in this game, you are also battling the clock and the other survivors. 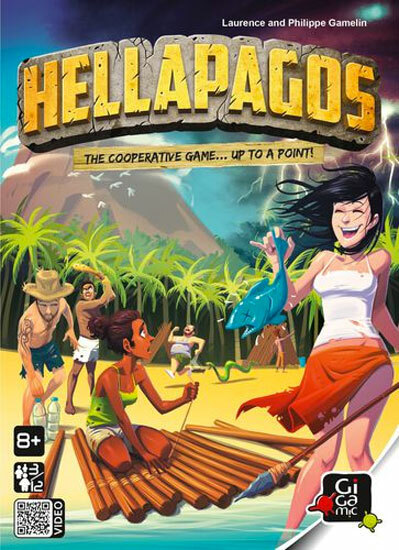 Hellapagos is a semi-cooperative game for 3 to 12 players to play in around 30 minutes. In my experience, the game plays best with 4-8 players. After becoming shipwrecked, a group of castaways are trapped on a deserted island. While the view is picturesque, water and food are scarce and one heck of a storm seems to be brewing in the distance. The consensus is that they need to get off the island by building a large raft before the storm hits. The use of pulling wooden balls to determine the fish and wood collection is a neat idea and adds more tension then expected to each pull. 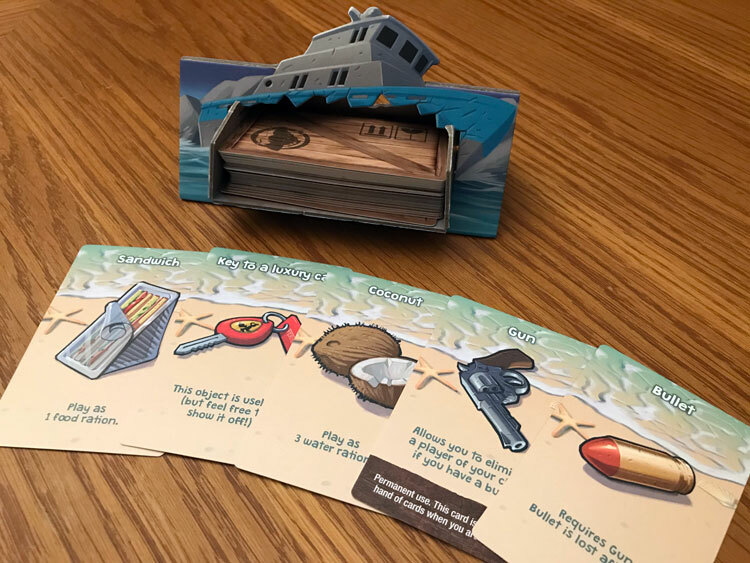 Each round, players will have the choice of building the raft, going fishing, collecting water, or searching the wreckage for useful items. While each is simple, they are full of challenges. When exploring for more wood, you could be bit by a snake that can cause a loss of turn or when fishing you could come up with nothing. The results are determined by pulling balls out of a burlap bag for both of these actions. Water collection is determined by the weather that day and could be nonexistent. Finally, searching the shipwreck is filled with both useful and useless items. At the end of each round, players will consume food and water for each player in the game. If there isn’t enough to go around, there will be a vote to choose which of the players haven’t pulled their weight and are to be eliminated from the game. However, players can save themselves by playing a wreckage card that helps with that particular shortage or use other cards to help their case, like a gun to eliminate another player. 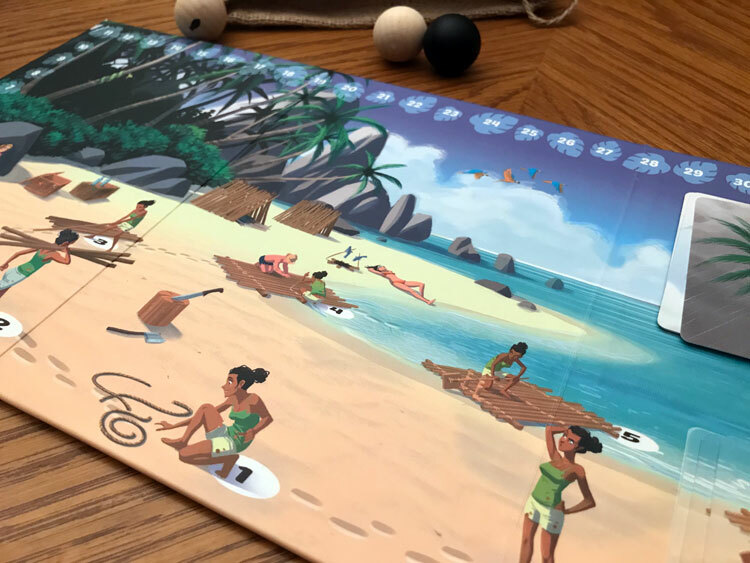 While the board may make the game look picturesque, the actual game play is the opposite. Players will soon be looking out for themselves over the group just to stay alive long enough to win the game. At the start, Hellapagos seems like a cooperative game where you can easily band together to make it off the island. While the land might not be flowing with milk and honey, there should be enough food and water to go around as you build this raft. However, a few bad fishing trips, no water falling from the sky, players being bitten by snakes while searching for wood, and the game quickly turns from a game of survival to every player for themselves. The base mechanics of the game are simple and this is a good thing. All the actions you take are under twenty seconds and allow for rounds to progress quickly. The use of the bag and balls to determine success with fishing and wood collection is innovative. It’s basically like using a die to determine a result, but in a much more interesting manner. 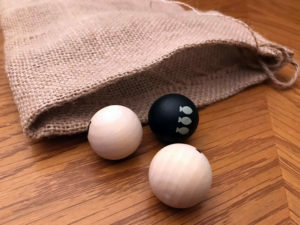 The bag adds tension as you pull balls but that isn’t the same as drawing a card or rolling dice. I wish that there was a similar mechanism for collecting water. I feel there could be something more engaging than just the value on the weather card that round. Searching the wreckage deck and earn you some useful items, however, some can be completely worthless. The wreckage salvaging is a necessity, but it comes at a cost of potentially not helping the other group needs that round. The collection of items helps a lot to spice up the gameplay. You can get those extra food or water rations that you need, special items that make you more effective and valuable, and even worthless items. Most cards have some value and will come into play during the game. I like how all the cards are kept hidden from the other players and allows for some twists you don’t expect when you get to voting. While the game has the premises that all can get off the island, more than likely you won’t. This makes voting a vital part of the game. I also liked that if a player is voted to be eliminated, they can still save themselves with a card salvaged from the wreckage. This causes voting to occasionally have some interesting results. In one voting round, I played a card to allow me to vote twice and then the player I eliminated ended up killing me off with a gun. It was an entertaining moment and these happened throughout my experience. If a few fishing trips go bad or poor water collection days hit your party, you will be scrambling to have enough food and water for everyone. However, Hellapagos also needs to be played with the right group. If player elimination doesn’t work for your group I would steer clear. Also, the game can go south quickly for you. I have had times that you eliminated 3 and 4 players in one round because of the weather card not providing water and fishing was poor. It’s almost to the point where I feel that players don’t have much of a chance at the start of the game to have all the players make it out. Not only do you have to try to keep your players hydrated and feed, you also need to find time to build the raft; which is difficult to do with everything else that is going on. Hellapagos is a unique experience. All the actions are simple and quick, allowing for a game to go at a lightning fast pace even with higher player counts. Players will ultimately turn on each other when the food/water runs out though. Hellapagos has that true survive an island feel. However, the gameplay leads to an uneven experience because of the randomness of some actions. This can cause you to be extremely short on food/water losing a lot of players in one round. Also, the game is just hard. It becomes difficult to get a few players off the island before the hurricane hits. Despite these issues, I’m keeping Hellapagos in my collection. The easiness of teaching allows it to be a good game to bring out with larger gatherings that will enjoy the elimination element. 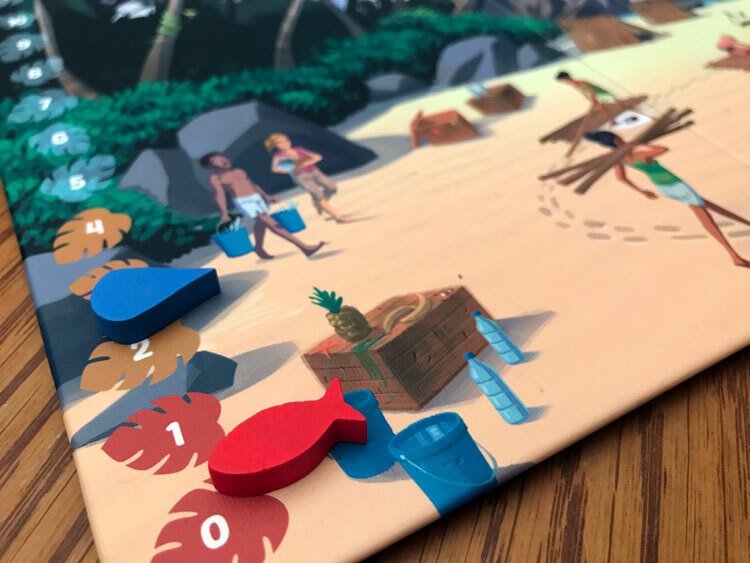 Final Score: 3.5 Stars – A game of survival and scheming as you attempt to position yourself to be one of the lucky few to get off the island. Thanks for the review! You can tailor the difficulty a bit with the composition of the water deck. You could elect to make the storm non-random, placing it as the 7th card (I do this for demos to control game length) and you can also choose how many water cards go above. Increasing water flow means that one action can satisfy the needs of multiple players, thus leaving more room to collect other necessary things. A lot of the game is really what the players themselves bring to the table… I have seen players vote themselves out to allow others to go on. Also, fewer players tends to deliver more cooperative wins where higher numbers will naturally skew more competitive. The highest number of survivors I have seen is 7 (including a full table escape). The players who really engage in the game are the ones who are interested in social deduction and collusion games… deception and treachery, even increasing the difficulty to spawn more conflict.